Catch a glimpse of the majestic elephant on Elephant King Slot at Wicked Jackpots! It is brought to you by IGT, packed with 5 reels and 40 paylines. This beautifully designed game takes you to the African savannah where magnificent animals live. Enjoy the peaceful atmosphere of the plains while the scorching hot sun is creating a yellowish glow everywhere. The reels are set within a well-embellished frame and are full of symbols like the Gazelle, Rhinoceros, Elephant, Zebra, Blue Gem, Spade, Heart, Club and Diamond. Don’t miss this game on any device at Wicked Jackpots! 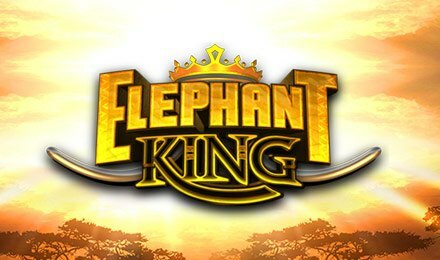 Begin your adventure by placing your bet on Elephant King Slot! Select your desired betting amount on the Coin Value display and adjust your stake with the + and – buttons. When everything is set, click on the Spin button to enjoy your gameplay. You can also press the Auto Play tab to pick several automated rounds that are played without interruption. Bet Levels: There are no betting levels available. Amount of Paylines Selection: All the 40 paylines stay active and cannot be altered. Coin Values: Place your bet using one of the following coin values: 1.00, 2.00, 3.00, 5.00, 10.00, 20.00, 25.00, 30.00, 50.00, 100.00, 200.00 and 300.00. On Elephant King Slot, the Elephant King is the Scatter which helps to activate the main bonus features. The scattered Elephant King on reels 1, 2, 3, 4 and 5 triggers the Free Spins round. The free rounds can also be triggered during the Prize Disk Feature when one or more Free Spin symbols appear. Each triggering Free Spins icon awards 10 free spins. With one or more Extra Spins symbols during the Prize Disk Feature, the free spins are retriggered, and you can earn 2 extra spins. During the Free Spins round, a different Prize Disk comes into play. You can retrigger the feature several times, going up to 250 free spins per bonus round. Watch out for the Native Shield and Spear icon on Elephant King Slot as it is Wild! It chips in for any symbol, except Scatter to create winning combinations. Land the scattered Elephant King simultaneously on reels 1, 3 and 5 to activate the Prize Disk Feature. Here, a win is possible on every single spin! All the prizes are displayed above the reels. You can also trigger this feature during the Free Spins round when the Elephant King symbol lands on all the reels, awarding more cash prizes and spins. During the Prize Disk feature on Elephant King Slot, the rewards on the Prize Disk shift 1 reel to the left and introduce a different prize in the Prize Disk position above the fifth reel. Possible prizes range from 500 to 10,000x the coin value. Elephant King Slot is worth a try at Wicked Jackpots where you can enjoy your favourite online games. Wish you good luck!